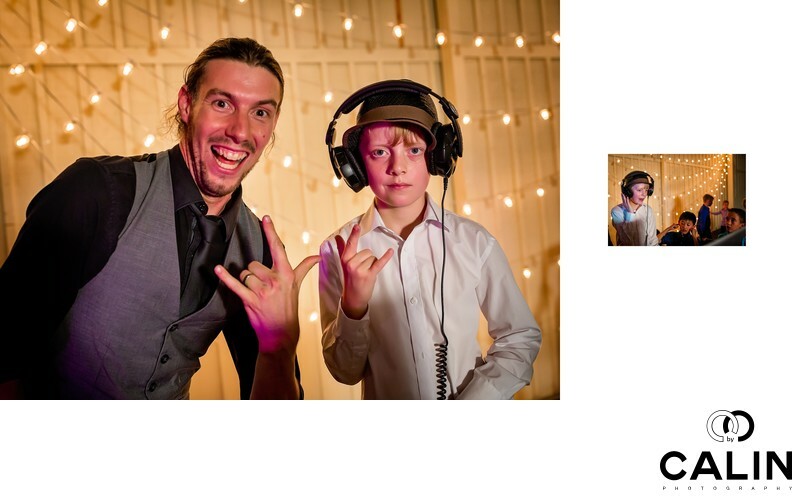 During this Black Creek Pioneer Village wedding reception the couple's son went to the DJ's table. He picked a headset and started spinning of the turntable. It was in this moment when the bride and groom asked me to take a picture of their son. "Of course, I said" and I pointed my camera to the DJs table. Oblivious to my presence, the son was absorbed in his work. As such, I snapped a few frames and then asked him to pose for me. It was then when he raised his hand and gave me the hang loose Hawaiian sign you see in the left image. The picture on the right shows the same teenager interacting with other kids at the DJs table. While this album spread does not employ any sophisticated photography techniques, it is a clean documentation of the wedding day. It's value consists not in the artistic nature of the photos but in the documentary nature of them. After all it is more important to document the day properly then to deliver a handful of artistic images. Most of the time the couples will prefer the first option. One of my pet peeves when it comes to Toronto wedding photography is that the industry focuses too much on pretty pictures of the banquet hall and immovable objects instead of immortalizing guests. Specifically, many photographers spend an exaggerated amount of time photographing the shoes, the rings, the dress, etc. Meanwhile they miss the essence of the wedding, namely the people. In 30 years from now the bride will most probably wants to see pictures of her grandmother then images of the wedding favours. As such, as a Toronto wedding photographer, it is my duty to educate the brides so that they receive a collection of images that immortalize the moments and the guests.